Many children of incarcerated parents live in impoverished households, are exposed to substance abuse, and have witnessed or been victims of family violence prior to the parent’s arrest. Describing the mechanisms through which parental imprisonment affects child development is crucial for designing programs to ameliorate the negative effects. However, attempting to disentangle the influence of parental incarceration from the myriad of other risk factors to which many children of incarcerated fathers are exposed is a challenge that has been poorly met by the existing research literature. Many children of incarcerated parents live in impoverished households, are exposed to substance abuse, and have witnessed or been victims of family violence prior to the parent’s arrest (Parke & Clark-Stewart, 2001). Rather than a discrete stressful event in children’s lives, parental incarceration might be better conceived of as a chronic strain, interacting with a host of other risk factors (Johnson & Waldfogel, 2002). Parental incarceration is a process that unfolds over the course of many years and presents children with distinct challenges before, during, and after parental imprisonment (Hagan & Dinovitzer, 1999). At the time of arrest, children who reside with the arrested parent are frequently exposed to trauma (Jose-Kampfner, 1995). Those who witness the parent’s arrest or criminal behavior often suffer nightmares and flashbacks (Johnston, 1991). The incarceration period itself presents children with a range of challenges, including separation issues, loss of family income, disruption in the home environment, and stigmatization. When the parent is released, a new set of stressors emerge (this topic is covered in more detail in Chapter 6). Below, we discuss primary stressors associated with parental incarceration. Separation is a significant challenge for children of incarcerated fathers, who are typically away from their parent much longer than children of incarcerated mothers (Parke & Clarke-Stewart, 2003). An average sentence for fathers in state prison is 12.5 years, approximately 5 years longer than the average sentence for mothers (Mumola, 2000). One-third to one-half of incarcerated fathers never see their children during their imprisonment. Poehlmann’s (2005) qualitative study of 94 incarcerated mothers indicated that more frequent contact during incarceration was associated with more positive parent-child relationships, particularly with older children. Contact, however, is limited when a parent is in prison. A recent study indicates that two-thirds of fathers had never received a visit from their child (Day et al., 2005). Lanier’s (1991) random sample of 302 men incarcerated in a maximum-security prison in New York found that 30% of fathers participated in family reunion visits (24-hour “trailer visits”) with their children, 43% participated in family picnic days with their children, and 67% received conventional visits from their children. Of those who received visits from their children, 37% reported that such visits occurred less than once a month. A majority of fathers reported regular “distal” interactions with their children: 64% reported phoning their children at least once a month, including 45% who phoned their children at least once a week; 73% reported sending mail to their children at least once a month; and 56% reported receiving mail from their children at least once a month. Both proximal and distal father-child interactions during incarceration were positively correlated with a father’s residence with his children prior to incarceration and his expectations of residing with them after release (Lanier, 1991). Based on national data from the 2004 Survey of Inmates, Glaze and Maruschak (2008) reported that 30% of fathers incarcerated in state prisons had some form of weekly contact with their children, and another 23% had some form of contact at least monthly. Seventeen percent of fathers reported contact less than once a month, and 22% had no contact with their children during the current incarceration. Mail was the most common form of contact fathers experienced, with 69% reporting any mail contact with a child during their incarceration. Fifty-three percent reported having any phone contact with a child during their incarceration, and 41% reported having any personal visit with a child (Glaze & Maruschak, 2008). 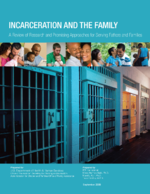 Hairston, Rollin, and Jo’s analysis of the 1997 Survey of Inmates data found that incarcerated fathers were less likely than incarcerated mothers to maintain contact with their children while in prison (2004). African American parents were somewhat more likely than white or Hispanic parents to report visitation or phone contact with their children during incarceration (Hairston, 2008). Children may be prevented from contact with their parents because the custodial parents or other relatives do not want the children to know that one of their parents is incarcerated, do not want to expose them to the prison visitation environment, or cannot afford to maintain contact (Hairston, 2001). The distance between a prisoner’s home and the facility at which he is incarcerated is a strong predictor of any in-person contact (Hairston, 2008). In addition, the quality of relationships between incarcerated parents and their children’s caregivers appears to play a central role in determining frequency of parent-child contact (Poehlmann, 2005). For fathers who perpetrated domestic violence prior to incarceration, partners and caregivers may view the incarceration as a welcome reprieve for children who formerly witnessed or experienced violence in the home (Hairston and Oliver, 2006); in such cases, they are not likely to encourage maintenance of father-child contact during the incarceration. Because of stigma, children with fathers in prison are frequently denied the social support and sympathy provided to children experiencing other types of parental separation or loss such as divorce or death. Initial qualitative findings from a 3-year ethnographic study of families of male prisoners in Washington, DC, suggest that children are also affected by social stigma during a parent’s incarceration (Braman & Wood, 2003). Other qualitative work indicates that children of incarcerated parents may not be privy to the social support and sympathy otherwise afforded families experiencing the involuntary loss or absence of a family member (Arditti, 2005; Hagan & Dinovitzer, 1999). Children may be exposed to criticism of themselves or their mothers regarding their involvement or lack of involvement with their incarcerated father (Braman & Wood, 2003). Finally, children who maintain in-person contact with their fathers during incarceration may undergo potentially stigmatizing experiences in the correctional environment as part of the visitation routine (Arditti, 2005; Hairston, 2001).